Rocky areas on the Zambian shore of Lake Tanganyika, Africa. 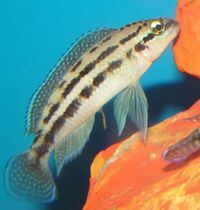 Only compatible with other Lake Tanganyika African Cichlids. Keep these fish as a pair, can be aggressive towards other of their own species and fight to the death. Prefers live foods including brine shrimp and bloodworm. Will also accept Cichlid pellets. Keep in a tank with plenty of caves and sandy substrate.